Do you watch Seinfeld reruns? I own all 9 seasons on DVD, and I truly believe that all the idiosyncrasies of life can be boiled down to a Seinfeld episode. I'm kind of sad here in China because no one understands my many Seinfeld references I make in everyday conversation. Unlike in the USA, I know zero people here who have watched enough Seinfeld--or any Seinfeld--to understand my references. So sad! Anyway, there's an episode of Seinfeld where George asks Newman why postal workers "go postal." And Newman starts freaking out, shouting about how the mail never stops; it just keeps coming and coming and coming...! If you haven't seen it (or you just want to enjoy it again), here's the clip. I see shelving library books the same way Newman sees the daily mail. The books keep dropping into the book return. Boom, kerplunk, thud! It never stops!!! Argh! So today, I have some tips. These will probably benefit new librarians more than seasoned librarians, most of whom, like me, have figured out our systems for shelving. After 13 years of shelving what's likely hundreds of thousands of library books, I feel like this this system is the fastest for me. 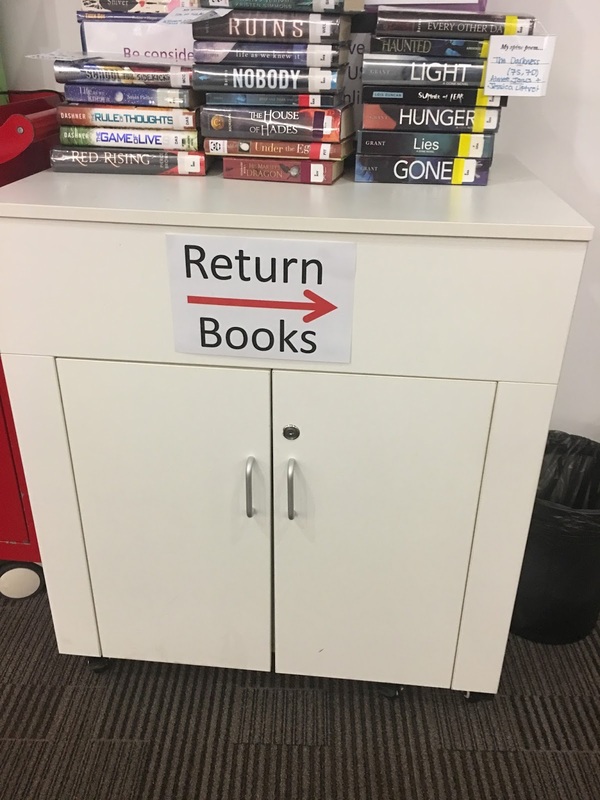 I'm sure other librarians have similar or different systems that work for them. TIP #1: INVEST IN LIGHTWEIGHT SHELVING CARTS. My very first library was a brand-new elementary school. I had two beautiful solid wood shelving carts, exactly like this one from Demco. Did you catch the sarcasm on that one? Solid wood shelving carts? They were so heavy! Even in the Demco description (see link), it says "Maximum capacity of 800 lbs. per truck, evenly distributed." 800 pounds! Apparently they thought I was Wonder Woman. On top of that, I was five months pregnant with my now-12-year when school started that year. These booktrucks were not easy or practical, and with our 900+ PreK-4 student population, the cart stayed full constantly. 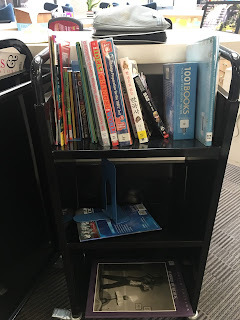 The parent volunteers (no aide) and I ended up leaving the wooden shelving carts behind the library desk and used old overhead projector carts to shelve books instead. I see that Demco is still selling the wooden carts, so there must be schools that are using them. I hope that if you have wooden carts, you also have a lighter-weight cart for shelving books. My next three schools (including my current school in China) all have steel shelving carts, like these from Demco. They move easier and don't weigh nearly as much as a solid wood cart. If you have only the solid wood carts, I urge you to think about investing in a steel cart. They are far less expensive than wood (though still not cheap), and they will make your shelving life much easier. My current library has two of the big steel carts and two smaller ones, though we use the smaller ones almost exclusively. TIP #2: LABEL YOUR SHELVING CARTS. Whatever shelving cart you are stuck with, you will get much more done if you use your carts to sort the books before you go to shelve them. In my library, we mainly use our two smaller shelving carts. We use one for fiction and one for nonfiction and non-English titles. 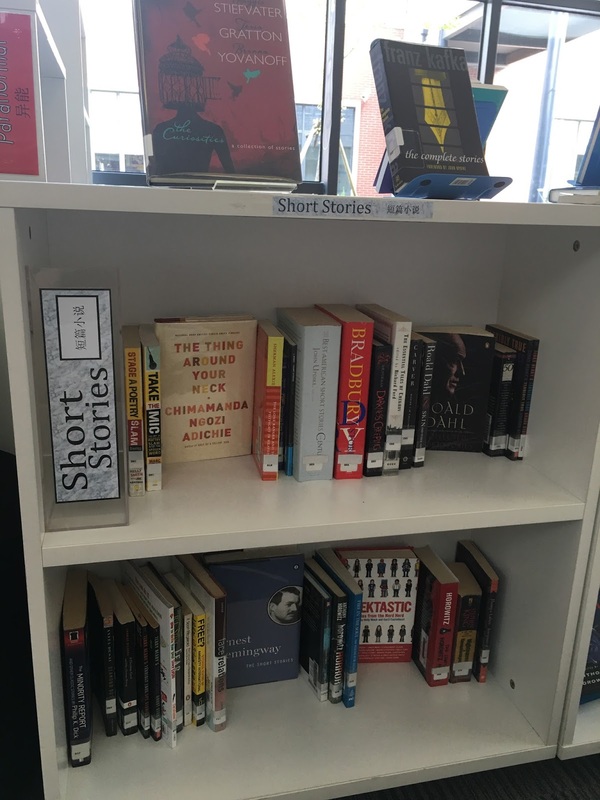 If you have only one shelving cart, you could use one side for fiction and one for nonfiction. We used masking tape to label the shelving cart with Dewey numbers and genres. 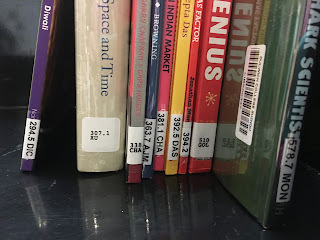 For the nonfiction cart, we put the most popular Dewey numbers (in my library, 300, 500, and 900) on the top shelves, so they are easiest to reach. Dewey numbers 100, 200, 400, and 800 don't get nearly as much checkout in my library as other sections, so those go on the bottom row of the cart. For the fiction cart, we have Battle of the Books on the top shelf (very popular in our school), along with Fantasy and Sci-Fi. Graphic novels and Mystery are in the middle, and all other genres are at the bottom. Because they are on top, we do tend to shelve these sections first, which is good since they are so popular anyway. I suggest labeling your cart with masking tape, at least at first. This makes it easy to implement and change as needed. TIP #3: MAKE IT EASY FOR STUDENTS TO CHECK OUT FROM THE SHELVING CART. Locate your shelving cart in the same place every day, preferably somewhere students can easily see and access it. Do not keep it behind your circulation desk. Some students will ask if a book is on the cart, but many will not. If you put the cart out where students can access it (preferably with a big sign that says "Look what just came in!" or "Look what's popular! "), they will checkout books from the cart, which means you won't have to shelve all of them. TIP #4: BEFORE YOU SHELVE, PRE-SORT YOUR BOOKS ON THE CART. Okay, so you have three minutes to shelve before the next class comes in! (cue "William Tell Overture") If you have pre-sorted your books on your cart, you can easily grab a handful and shelve them in those three minutes. Since they are all going to the same place, you'll probably have time to shelve a couple of handfuls. If you have lots of Dewey numbers to shelve, I also recommend sorting the books on the shelving cart by Dewey. I remember as an elementary librarian, I would easily have a hundred or so books from the 590s to shelve each day. Yes, a hundred each DAY, just for the 590s! Those pesky 596s and 599s were the toughest to shelve because the numbers were so close. It really helped if I had presorted them on the shelving cart. I could do all the 596 books at once, then move to the 597s. Presorting the books on the cart only took a few extra minutes, but it made a huge difference in my ability to shelve the books quickly. TIP #5: MAKE USE OF YOUR DISPLAY SPACES! Oh my goodness, this one is a biggie! Students checkout books that are on display far more often than they check out books in the stacks. Who wouldn't choose that beautiful book about spiders with the big, hairy tarantula on the front cover? Or that gorilla book with the adorable gorilla baby on the cover, staring out at us with his big, round gorilla-baby eyes? Everyone loves a beautiful cover image! Save yourself some shelving time by displaying some of the books you are reshelving on top of the shelves. In the photo above, I have plenty of room to display some more books on top of the shelf, as well as in the empty spaces within the shelves themselves. To keep the books easy to find, you'll want to still put them above or near their call number section. TIP #6: LABEL YOUR SHELVES WELL. 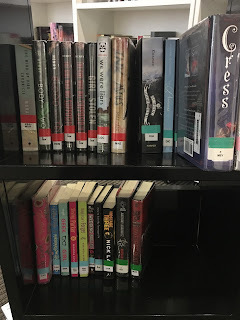 When your library shelves are well-labeled, both you and your students can find what you need quickly. I did a post several years ago about how to create these easy and inexpensive shelf signs, and I have used them ever since. Buy or make labels for subsections of Dewey for popular topics like cars and pets and cookbooks. TIP #7: DON'T SWEAT THE SMALL STUFF. 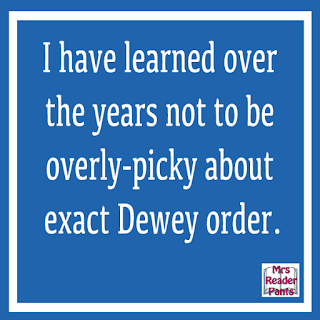 "I have learned over the years not to be overly-picky about exact Dewey order." Are your shelves very out of order? I know that in elementary libraries especially, the shelves of popular sections get very out of order very quickly. Just do your best. I have learned over the years not to be overly-picky about exact Dewey order. If those pesky 599s are a mess--as they frequently are--I am okay to leave it imperfect until I have time to get to it. As long as the 599s are not mixed with 578s or 731s, I'm happy enough. It doesn't matter much to me if a panda book is with the giraffe books. I have bigger fish to fry, and for now, it has to be close enough. For Fiction and E sections, do not worry about detailed alpha order for the same call number. For example, if the call number is E HEN, do not worry if it is Henkes or Henderson or Hensarling. If you work for the Library of Congress or a huge public library, this makes a bigger difference. 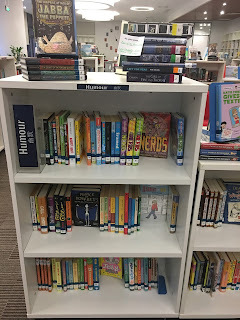 In a suburban elementary school library, HEN is sufficient for all the Henkes, Hendersons, and Hensarlings. The only thing I do here is try to keep series books by the same author together. TIP #8: SPOTLIGHT SERIES BOOKS AND MAKE YOUR LIFE EASIER. Series books get a lot of checkout. A series by one author is easy to keep together on the shelf. But for multi-author series like The Infinity Ring or The 39 Clues, shelving the series traditionally would break up the series. Students and teachers would have to know or look up the author of the next book in order to find it. In my library, we change the call number for multi-author series to reflect the first three letters of the series, rather than the author's name. For example, the Spirit Animals series has the call number HIGH FANTASY SPI, the SPI being for Spirit Animals. This keeps the series together on the shelf, making it easier for students to find and for me to shelve. Our Junior School Library recently purchased some acrylic shoebox-sized bins (kind of like these) for series books. I love these! They save shelf space and call attention to the series. I've also seen libraries that shelve large, popular series like Junie B. Jones and Magic Tree House in a separate series section altogether. This would also make shelving easier on you. For series, do not spend a lot of time putting series books in chronological order. I've never worry much about this, yet my series books mostly stay in order. Some students, especially those who really love a particular series, will put them in order without being asked, just because they like it that way. Thanks, guys! TIP #9: TRAIN YOUR STUDENTS. I know a librarian who trains her students--from K-5--to check in their own books and reshelve them. Now, I can't imagine that this system is perfect, but she is excited about it and says it really works. 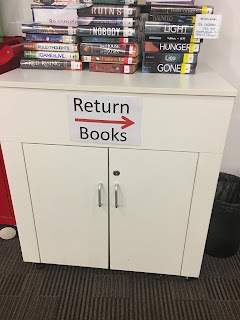 When students come into the library, they scan the library book they are returning. They then go to the shelf--I'm sure a lot of students remember where they got the book--and shelve it in. I have not been in elementary for many years, but I would be open to trying this. I would probably start out with the older students and work my way down. Certainly, all of them can at least check in their books. They would enjoy it! Of course, you would need to be there to watch and make sure all the books got checked in, but in time, you could put a responsible student in charge of this. For shelving, I would probably start by having students put their books on top of the shelf where they got it. This would train them to remember the where they got their book each week. I would then check and shelve the books while they worked on an independent activity or read quietly. I would take a laptop and scanner with me so I could see which student had just turned a particular book in. Then I would call the student over and help him or her shelve the book. Yes, all this does sound easier said than done, and I'm sure it won't work with every class in every school. But it's worth considering, even if it is only for the upper-elementary classes. I do think librarians would have to let go of some control about library books being in perfect order or always being checked in properly. If students do their own check-in and shelving, it won't be perfect. TIP #10: DON'T SHELVE EVERYTHING--SAVE BOOKS FOR TEACHERS. No matter what school or grade level I serve, I always have at least a couple of teachers who like to check out a small independent reading library for their classroom. They may come in every couple of weeks or so and change out a stack of 20 books for a new stack of 20. You can save time for both yourself and the teacher if you keep a stack of books for the teacher. Order some shopping baskets like these or these (you can probably find book-sized storage baskets even cheaper at your local dollar store) and label them with the teacher's name and grade level. I have also used these book baskets on wheels from Demco. They are durable, but they are more pricey. When a book is turned in that would work for that grade level, pop it into the teacher's basket. When the basket is full, deliver it to the teacher. She can put the previous set of books in the basket and have a student bring it down to turn in. Yes, you'll still have the same number of books to shelve, but the teachers will love you for helping keep their classroom library fresh. TIP #11: GENREFY YOUR FICTION SECTION. Genrefying my fiction section has made shelving so. much. easier. Yes, genrefying takes a lot of time, but it is SO WORTH IT in the end. You can shelve fiction in a flash when your library is genrefied because the Fiction section isn't 5000 books anymore. It's broken up into much smaller, color-coded divisions. 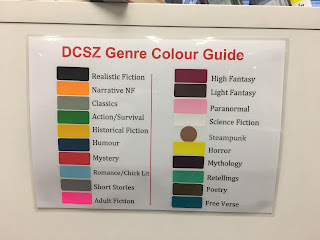 This also makes it very easy to spot a Mystery book (red) shelved in with the RETELLINGS section (mint green). The mismatched color practically leaps off the shelf and grabs your attention. For more information and tons of resources on genrefication, see my Genrefication page. 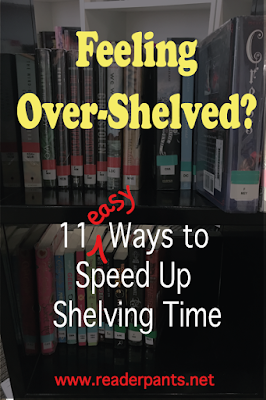 Got more shelving time-savers? Please share in the comments! You are such a valuable asset to my job!!! Thank you for all the time you put into making us all better at what we do!! Great,Thanks! I had to laugh because I already DO so many of these ideas, especially the cart hints. It made me feel good that someone else does what I do. So many times I wonder if "there's a better way?" So to see it in print, from someone else is affirming. Thanks so much. So true! I am still on the constant hunt for some new way that will change my shelving life. We need to invent a shelf-bot. Makerspace idea? These are all so helpful and I'm pleased that I do a bunch of them already, but this is great and I absolutely can relate-- it is NEVERENDING in the best way possible. I agree with all of your suggestions-especially presorting on the cart which I do as I check in the books. What helps me the most in our K-4 Library is using labeled (with text and picture) tubs. I try to keep the nonfiction tubs close to the area they would be shelved such as snakes, dinosaurs, dogs, etc. On our long row of windowsill area I keep tubs for series such as A to Z, Junie, and MTH. 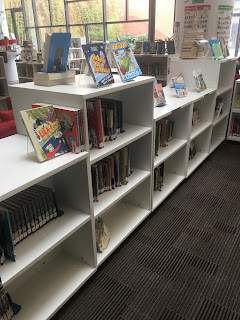 This system helps the kids find the books they want, spreads the class members out throughout the Library, and certainly makes shelving easier for me, myself, and I to do. I agree with many of your suggestions -- except genrification. 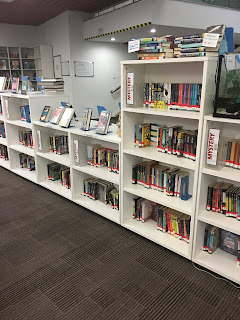 I have a high school library that was genrified before I arrived -- circulation is no higher, and it takes so much longer to get the books onto the shelves when they are purchased. And I have never figured out how to decide quickly what to do with a sci-fi/romance or fantasy/romance, etc. Perhaps the genres picked are the problem. Thank you for being someone like me who isn't afraid to have her animals mixed up from time to time! My kiddos will figure it out when the dogs are with the grasshoppers! For us, it's our sports section -the 796s that are the bane of our existence. We bought some Demco shelf dividers with lable pockets and made wordart lables throughout nonfiction. The subject, a picture, and a directional arrow indicate where to find them. So now we just group all the basketball books to the right of the divider without concern for any further organization until invemtory. Same for cats, dogs, how to draw, cook books, etc. Sooooo much faster and better organized now that the kids (k-8) can see where everything goes. I am also a teacher that has the students put the books back themselves if they remember where they got it from. If they do not they put it on the return cart. It does cut time from reshelving books! This is my first Retired Year, but I still watch your blog!